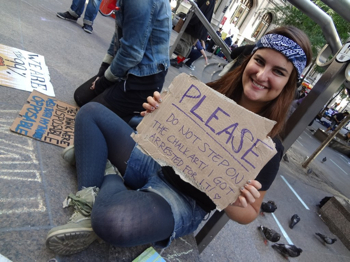 The 99 Percent Demand: Occupy Wall Street! Bring Our War Money Home! -Edited to add: this morning (Tuesday, September 20th) several protesters, including members of the Occupy Wall Street media team and Jason Ahmadi of the War Resisters’ League, were arrested — some violently. Reports that some of the protesters are in critical condition have yet to be confirmed. 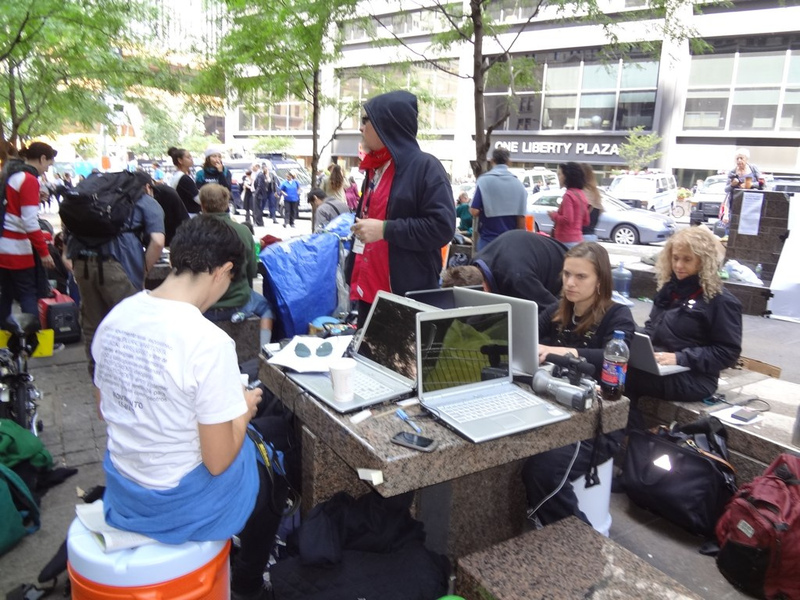 Day three of the encampment at Liberty Plaza, formerly known as Zuccotti park, is coming to a close. A lively group stands at the corner waving cardboard signs to passersby: JOIN US. WE ARE THE 99%. Helium balloons pop up throughout the park, boosting morale and providing helpful markers (“Where are you sleeping?” “Over by the red balloon”). From the other side of the park, where we sit eating some of the $6,000 worth of pizza donated to the protest thus far, we hear a loud stream of honking from Broadway. People jump to their feet, speculating it’s the Hell’s Angels. Rumor has it they are part of the 99%. 10 am: I arrive in the plaza to find five people have already been arrested during a march from Liberty to Wall Street for the opening bell of the Stock Exchange. At around 11:00 am a crowd rushes towards the sidewalk on Broadway chanting “shame!” – police are arresting two people for drawing on the sidewalk with colored chalk. Returning to the scene of the crime Andrea Osborne, one of the chalk offenders, tells me that before she was arrested, one of the NYPD officers told the demonstrators it was okay to draw on the sidewalk. People converge for a General Assembly – one of many that will take place today – to give legal updates and advice. The General Assembly, or GA, is an open, participatory forum through which decisions and announcements for Occupy Wall Street are made and the various working groups responsible for organizing Occupy Wall Street were formed. There is a committee for everything from medical help to direct action; as of today there is also a dumpster-diving committee, and a hygiene committee. The food committee, who on Saturday announced “no-one will go hungry on Wall Street” is concerned about the lack of vegan meal options. Every time I have been hungry, there has been food. Nobody can say we are not organized. 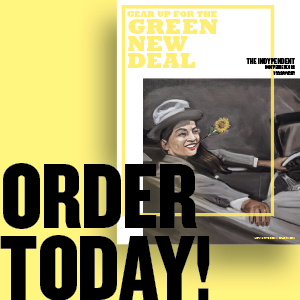 The media committee of the GA announces they’ve been fielding requests about how to respond to reporters asking “what is our one demand?” This question has pervaded the weekly GAs ever since Adbusters first issued the call to Occupy Wall Street back in July. The media committee reminds us that we are all here for our own reasons and no-one can speak for the group, but proposes that anyone interviewed include the following two words in their statement: “join us.” The proposal is passed through consensus demonstrated by raised hands, wiggling fingers, knocking fists. Seeing my hot pink “Bring Our War Dollars Home” sign, a member of the media team says “hey, CODEPINK! Thanks for the oatmeal!” I’m as surprised by the recognition as I am by her revelation that she has even seen food today; the only stationary presence in the park (with the exception of people sleeping), the media team never seem to stray from their intricately wired laptop hub, except maybe to light cigarettes. I ask her how she knew it was CODEPINK who brought the oatmeal: Twitter, naturally. On Saturday CODEPINK joined the mass demonstration at Bowling Green, marching with a Make Jobs Not War banner and encouraging people to demonstrate what they wanted to “make” instead of war with our mobile Make ____ Not War photo booth. In the week leading up to Saturday’s demonstration we joined with the Arts and Culture committee of the GA in creative, participatory actions aimed at demilitarizing Wall Street and building for the mass occupation. Night falls and I reconvene with The Arts and Culture Committee, who are discussing how to keep momentum and spirits up – hula hoops, radical cheerleaders, music – and the criminality of sidewalk chalk (apparently it’s legal if we clean it up afterwards). At 9:00 pm the first vegan pizzas arrive. 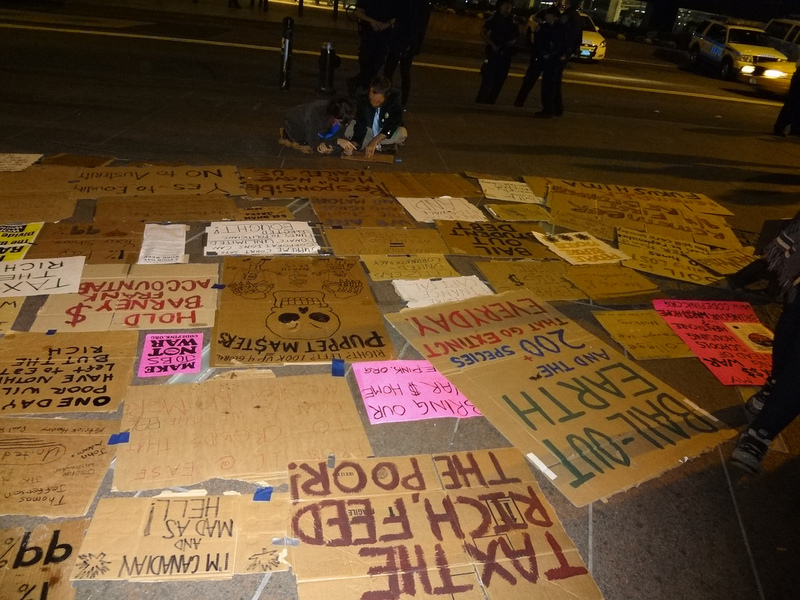 The ever-expanding collection of recycled pizza-box signs covering the sidewalk by the park demand an end to wars, funding for healthcare, bail outs for student debt, jobs, environmental and economic justice, and freedom for Troy Davis and Bradley Manning. At 9:30 the sound of hundreds of hands clapping from the other side of the park signals the GA is meeting. 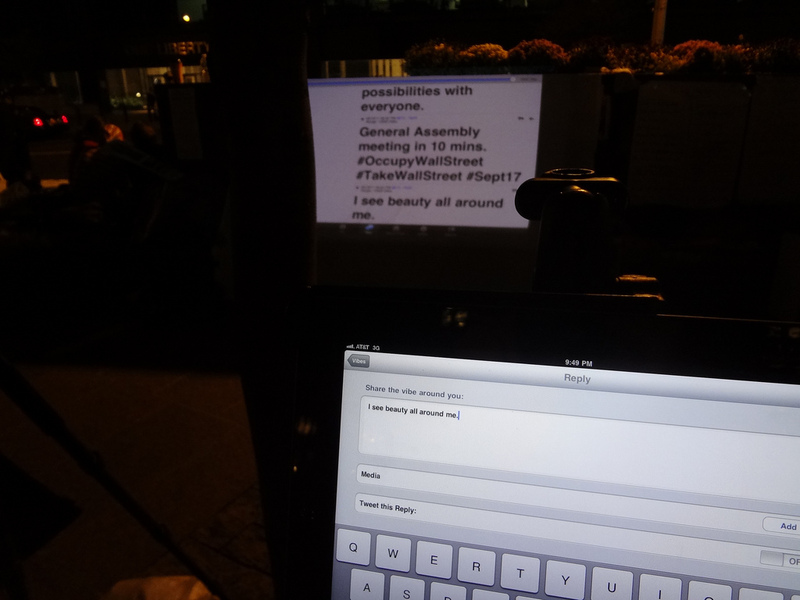 The message appears on a giant white sheet projected from a digital screen where anyone can send a message to people in the park and post to twitter and other social media. I send a message to the digital screen: I see beauty all around me. I look around at my brothers and sisters in the A & C committee, weary but alert. For some it is their seventh day of action and the third night spent in the park. We are tired. We are together. We are here.